Quantitative prediction of combustion phenomena and their active control require fundamental understanding of chemical kinetics as well as the associated flow which is frequently turbulent. Both processes pose formidable challenges due to species complexity, nonlinearity and the large range of length and time scales. Expanding flames, laminar or turbulent, implemented in a specially-designed dual-chamber fan-stirred vessel, not only have tractable initial and boundary conditions but can also be achieved with high pressures and large Reynolds numbers. 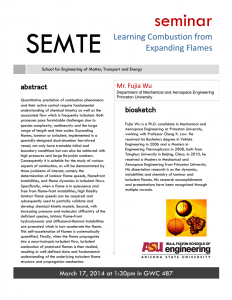 Consequently, Wu will discuss three problems of interest, namely the determination of laminar flame speeds, flamefront instabilities, and flame dynamics in turbulent flows. Specifically, when a flame is in quiescence and free from flame-front instabilities, high fidelity laminar flame speeds can be acquired and subsequently used to partially validate and develop chemical kinetic models. Second, with increasing pressure and molecular diffusivity of the deficient species, intrinsic flame-front hydrodynamic and diffusional-thermal instabilities are promoted which in turn accelerate the flame. This self-acceleration of flames is systematically quantified. 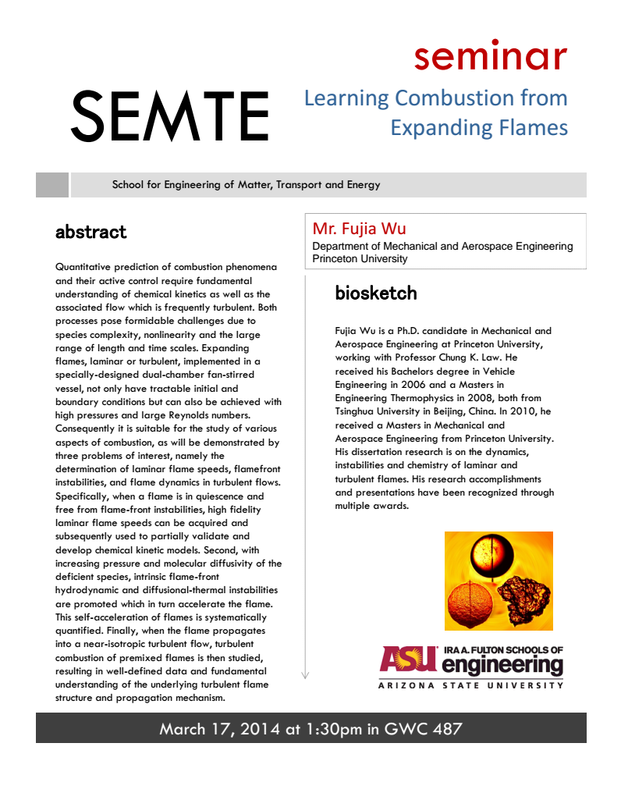 Finally, when the flame propagates into a near-isotropic turbulent flow, turbulent combustion of premixed flames is then studied, resulting in well-defined data and fundamental understanding of the underlying turbulent flame structure and propagation mechanism. Fujia Wu is a Ph.D. candidate in Mechanical and Aerospace Engineering at Princeton University, working with Professor Chung K. Law. He received a bachelor’s degree in vehicle engineering in 2006 and a master’s degree in engineering thermophysics in 2008, both from Tsinghua University in Beijing, China. In 2010, he received a master’s degree in mechanical and aerospace engineering from Princeton University. His dissertation research is on the dynamics, instabilities and chemistry of laminar and turbulent flames.